The Warrior archetype is getting another new Mech in Hearthstone's upcoming expansion, The Boomsday Project. 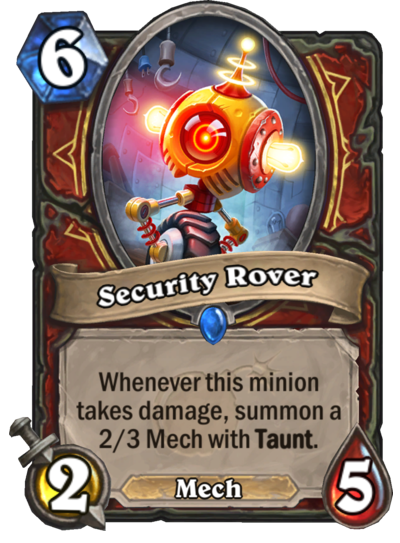 Security Rover is a six-mana Mech with two attack and five health. It has a pretty strong effect, though—whenever this minion takes damage, summon a 2/3 Mech with Taunt. This card looks like it could be pretty good, even though it may seem expensive for its stats. If you can combine Security Rover with a Whirlwind effect, you can get great value out of this minion. Since Security Rover is a Mech, you can also pair it was other Magnetic cards. And this Mech will have synergy with the new Warrior Hero card, Dr. Boom, Mad Genius, which gives your Mechs Rush for the rest of the game. In this combo, if you attack with Security Rover and take damage, you'll get to summon a 2/3 Mech with Taunt that will also have Rush. Security Rover isn't the only Warrior Mech that's been revealed from the upcoming expansion, though. Eternium Rover is a one-mana Mech with one attack and three health that grants you two Armor each time it takes damage. The reveal of cards like Security Rover could mean that a Mech control Warrior deck might be a part of the meta after The Boomsday Project is released—but it's still too early to tell since all of the expansion's cards haven't been revealed yet. The Boomsday Project is the second expansion of the current Standard year, the Year of the Raven. It'll add 135 cards to the game, including new keywords like Magnetic. Hearthstone's upcoming expansion can be preordered now—and all of the new cards will be released on Aug. 7.